Arthur Neville Chamberlain FRS ( /ˈtʃeɪmbərlɪn/ ; 18 March 1869 –9 November 1940) was a British Conservative Party statesman who served as Prime Minister of the United Kingdom from May 1937 to May 1940. Chamberlain is best known for his foreign policy of appeasement, and in particular for his signing of the Munich Agreement in 1938, conceding the German-speaking Sudetenland region of Czechoslovakia to Germany. When Adolf Hitler invaded Poland, the UK declared war on Germany on 3 September 1939, and Chamberlain led Britain through the first eight months of the Second World War. The Director of National Service was a post that existed briefly in the British government. Although a political appointment, the initial holder was Neville Chamberlain who was not a Member of Parliament at the time. Chamberlain resigned in August 1917 when the War Cabinet decided to change the organisation of recruiting from the control of the War Office to the Directorate of National Service, a change which he disapproved. In Westminster parliamentary systems, a backbencher is a member of Parliament (MP) or a legislator who holds no governmental office and is not a frontbench spokesman in the Opposition, being instead simply a member of the "rank and file". The term dates from 1855. The term derives from the fact that they sit physically behind the frontbench in the House of Commons. A backbencher may be a new parliamentary member yet to receive high office, a senior figure dropped from government, someone who for whatever reason is not chosen to sit either in the ministry or the opposition Shadow Ministry, or someone who prefers to be a background influence, not in the spotlight. By extension, those who are not reliable supporters of all of their party's goals and policies and have resigned or been forced to resign may be relegated to the back benches. For example, Clive Lewis becoming a backbencher after resigning from Jeremy Corbyn's shadow cabinet over Brexit. William Kenrick was an English iron founder and hardware manufacturer. 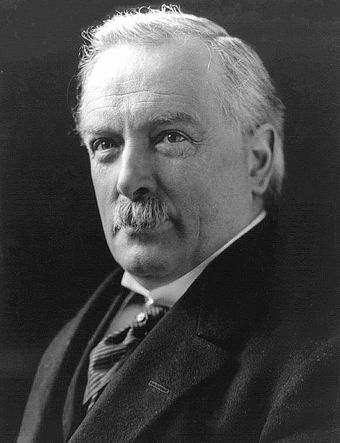 He was a Liberal Unionist Party politician who was active in local government in Birmingham and sat in the House of Commons from 1885 to 1899. Chamberlain is believed to have had a significant role in the 1936 abdication crisis. He wrote in his diary that Wallis Simpson, Edward VIII's intended wife, was "an entirely unscrupulous woman who is not in love with the King but is exploiting him for her own purposes. She has already ruined him in money and jewels ..."  In common with the rest of the Cabinet, except Duff Cooper, he agreed with Baldwin that the King should abdicate if he married Simpson, and on 6 December he and Baldwin both stressed that the King should make his decision before Christmas; by one account, he believed that the uncertainty was "hurting the Christmas trade". The King abdicated on 10 December, four days after the meeting. ↑ Joseph Chamberlain's loss is equivalent to £29.1 million if measured as per capita gross domestic product; £4.2 million if measured as an RPI equivalent. See MeasuringWorth. ↑ A well-known quotation by Disraeli, see Meynell 1903, p. 155. 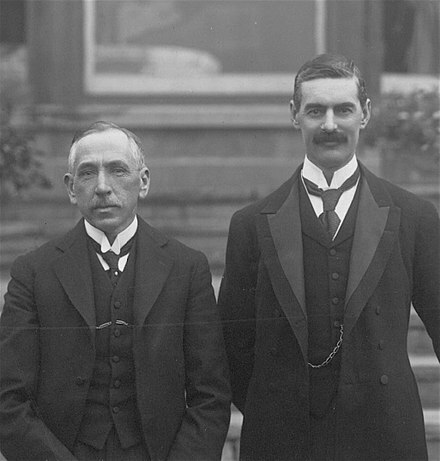 Chamberlain would later allude to Disraeli in stating he had brought for the second time "peace with honour" from Germany to Downing Street after the Munich Conference. ↑ "Peace in our time", a common misquotation, is a quotation from the Book of Common Prayer, and can be found as a misquotation in The New York Times as early as 2 October 1938. Faber 2008, pp. 5–7. ↑ Disraeli (or more properly Lord Beaconsfield) had stated "Lord Salisbury and I have brought you peace—but a peace, I hope, with honour." See Keyes 2006, p. 160. ↑ Smart 2010, pp. 2–3. ↑ Smart 2010, pp. 5–6. ↑ Smart 2010, pp. 6–8. ↑ Smart 2010, pp. 33–34. ↑ "The United Hospitals Conference of Great Britain and Ireland". The Times. 7 December 1906. p. 8. Retrieved 25 February 2013. 1 2 Self 2006, pp. 33–35. ↑ Dilks 1984, pp. 115–116. ↑ Smart 2010, p. 53. ↑ Self 2006, pp. 40–41. ↑ Self 2006, p. 41. ↑ Self 2006, pp. 42–43. 1 2 Who Was Who, 1929–1940. A and C Black. 1949. p. 235. ↑ Smart 2010, pp. 77–79. 1 2 Dilks 1984, p. 262. ↑ Hallam, David J.A. Taking on the Men: the first women parliamentary candidates 1918, Studley, 2018 chapter 4, 'Corbett Ashby in Ladywood'. 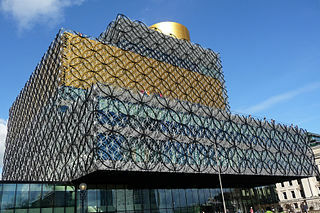 Chamberlain's letters to his sisters detailing the campaign are deposited at the Cadbury Research Library, University of Birmingham. ↑ Pepper, S. (March 2009). "Homes Unfit for Heroes". The Slum Problem in London and Neville Chamberlain's Unhealthy Areas Committee, 1919–21. 1 March 2009 – Academic journal article – By Pepper, Simon; Richmond, Peter. 80 (2): 143. Retrieved 1 March 2013. ↑ Yelling, J. A. (2004-07-31). Slums and Redevelopment. Routledge 1992. pp. 26–27. ISBN 9781135372286 . Retrieved 1 March 2013. ↑ Self 2006, pp. 79–80. ↑ Smart 2010, pp. 94–95. ↑ Self 2006, pp. 87–88. 1 2 3 4 5 6 7 8 Kelly's Handbook to the Titled, Landed and Official Classes 1940. Kelly's. p. 433. ↑ Smart 2010, pp. 106–07. ↑ Macklin 2006, pp. 24–25. ↑ Self 2006, pp. 116–18. ↑ Smart 2010, pp. 139–40. ↑ Dilks 1984, pp. 584–86. ↑ Smart 2010, pp. 160–62. ↑ Self 2006, pp. 161–62. ↑ Self 2006, pp. 165–66. 1 2 Dutton 2001, p. 17. 1 2 Smart 2010, p. 174. ↑ Maurice Bruce (1968). The coming of the Welfare State. Batsford. p. 370. 1 2 Dutton 2001, p. 18. ↑ Macklin 2006, pp. 36–42. ↑ Smart 2010, pp. 199–200. ↑ Ziegler, Philip (1991). King Edward VIII. Alfred A. Knopf. p. 312. ISBN 978-0-394-57730-2. ↑ Gilbert, Martin (1981). Winston Churchill, The Wilderness Years. Macmillan. pp. 169–70. ISBN 978-0-333-32564-3. ↑ Macklin 2006, pp. 44–45. 1 2 3 Self 2006, p. 261. ↑ Smart 2010, pp. 224–25. 1 2 3 Macklin 2006, p. 158. 1 2 Taylor 1965, p. 406. 1 2 3 4 5 6 7 Self 2006, pp. 298–99. 1 2 Smart 2010, p. 225. ↑ Smart 2010, pp. 225–26. ↑ Self 2006, pp. 273–74. ↑ Smart 2010, pp. 228–29. ↑ Smart 2010, pp. 230–32. 1 2 Self 2006, p. 286. 1 2 Smart 2010, p. 232. 1 2 3 4 5 6 Self 2006, p. 304. 1 2 Faber 2008, p. 148. ↑ Faber 2008, p. 156. 1 2 Faber 2008, pp. 159–60. ↑ Faber 2008, pp. 202–03. ↑ Faber 2008, pp. 199–200. ↑ Faber 2008, pp. 211–14. ↑ Faber 2008, pp. 230–34. ↑ Faber 2008, pp. 244–46. ↑ Faber 2008, pp. 263–66. ↑ Self 2006, pp. 310–12. ↑ Self 2006, pp. 312–14. ↑ Faber 2008, pp. 319–24. 1 2 3 Self 2006, p. 316. ↑ Faber 2008, pp. 340–42. ↑ Self 2006, pp. 318–20. ↑ Faber 2008, pp. 375–76. 1 2 Self 2006, p. 323. ↑ Faber 2008, pp. 403–07. ↑ Faber 2008, pp. 407–10. ↑ Faber 2008, pp. 410–11. ↑ Faber 2008, pp. 413–14. ↑ Self 2006, pp. 324–25. ↑ Faber 2008, pp. 417–18. 1 2 3 Faber 2008, pp. 5–7. 1 2 3 Faber 2008, p. 420. ↑ Faber 2008, p. 6. ↑ Faber 2008, pp. 420–21. ↑ Faber 2008, pp. 424–25. 1 2 Self 2006, p. 333. ↑ Self 2006, pp. 334–35. ↑ Smart 2010, pp. 250–51. ↑ Self 2006, pp. 344–45. 1 2 Self 2006, pp. 345–46. ↑ Self 2006, pp. 352–53. ↑ Dutton 2001, p. 58. ↑ Courcy 1940, p. 98. 1 2 Self 2006, p. 354. ↑ Dutton 2001, pp. 58–59. ↑ Self 2006, pp. 358–59. ↑ Philpott, Ian M. (2008). The Royal Air Force: An Encyclopedia of the Inter-War Years. Volume II: Rearmament 1930–1939. Pen and Sword. pp. 222–23. ISBN 978-1-84415-391-6. ↑ Self 2006, pp. 367–69. 1 2 Self 2006, p. 369. ↑ "BRITISH NOTE TO GERMANY. (Hansard, 1 September 1939)". hansard.millbanksystems.com. ↑ Self 2006, pp. 378–79. 1 2 Self 2006, p. 380. 1 2 Self 2006, p. 382. ↑ Self 2006, pp. 386–87. ↑ Self 2006, pp. 387–88. 1 2 Self 2006, p. 390. 1 2 Self 2006, pp. 415–16. ↑ Self 2006, pp. 420–21. ↑ Erin Redihan, "Neville Chamberlain and Norway: The Trouble with 'A Man of Peace' in a Time of War." New England Journal of History (2013) 69#1/2 pp. 1-18. ↑ Self 2006, pp. 424–25. 1 2 Self 2006, p. 425. ↑ Dutton 2001, pp. 63–64. 1 2 Self 2006, pp. 428–30. ↑ Self 2006, pp. 431–32. 1 2 3 Self 2006, p. 432. 1 2 Self 2006, p. 433. 1 2 Self 2006, p. 435. 1 2 Self 2006, p. 436. ↑ Self 2006, pp. 435–36. ↑ Self 2006, pp. 440–42. ↑ Self 2006, pp. 439–41. ↑ Dutton 2001, pp. 71–72. ↑ Self 2006, pp. 442–43. ↑ Self 2006, pp. 443–44. 1 2 Self 2006, p. 445. 1 2 Self 2006, p. 446. ↑ Self 2006, pp. 447–48. ↑ Self 2006, pp. 446–47. ↑ Gazette, London. 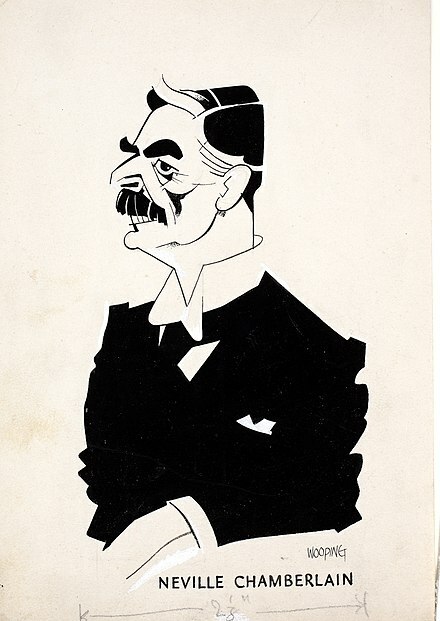 "The Right Honourable Arthur Neville Chamberlain" (PDF). Will probate instruction/information of Neville Chamberlain, Page 7145 – 16th December, 1941. London Gazette. Retrieved 13 March 2013. ↑ Dutton 2001, pp. 76–80. ↑ Dutton 2001, pp. 105–06. ↑ Dutton 2001, pp. 108–09. ↑ "XNC – Papers of Neville Chamberlain. 1. Family correspondence and other papers. NC1/2 (Transcribed Chamberlain family letters)". National Archives – University of Birmingham. Retrieved 15 February 2013. The letters were transcribed in 1915 by Norah Kenrick [wife of Neville Chamberlain's cousin and friend, W. Byng Kenrick] from the original letters then in the possession of Clara Martineau [daughter of Chamberlain's uncle, Sir Thomas Martineau]. ↑ "NC13/17/197-237 XNC Papers of Neville Chamberlain". Birmingham University Archives. Retrieved 2 March 2013. ↑ Walker-Smith, Derek. The Chamberlain City. 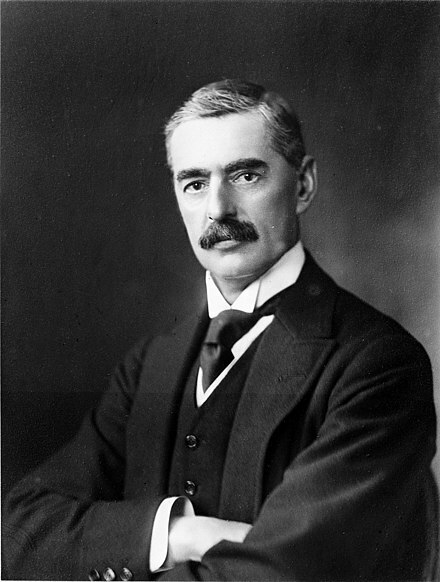 Arthur Neville Chamberlain. Million Dollar Books: 21 November 2003. Retrieved 14 February 2013. 1 2 Dutton 2001, pp. 133–36. ↑ Dutton 2001, pp. 143–44. ↑ Dutton 2001, pp. 157–61. ↑ Dutton 2001, pp. 162–64. ↑ Dutton 2001, pp. 167–68. ↑ Dutton 2001, pp. 182–84. 1 2 Macklin 2006, pp. 106–07. ↑ "St. Helen's Bishopsgate: Monuments within the church - British History Online". www.british-history.ac.uk. ↑ Craig 1977, p. 87. ↑ Craig 1977, p. 83. Leopold Charles Maurice Stennett Amery CH, usually known as Leo Amery or L. S. Amery, was a British Conservative Party politician and journalist, noted for his interest in military preparedness, British India and the British Empire and for his opposition to appeasement. The Norway Debate, sometimes called the Narvik Debate, was a momentous debate in the British House of Commons during the Second World War on 7 and 8 May 1940. It led directly to the downfall of the Chamberlain war ministry and to the formation of a broadly-based coalition government led by Winston Churchill, which governed the United Kingdom until the end of the war in Europe. Following on from an adjournment motion, the debate was primarily about the progress of the Norwegian Campaign but it quickly brought to a head widespread dissatisfaction with the overall conduct of the war by the Conservative-dominated National Government, led by Neville Chamberlain as Prime Minister. 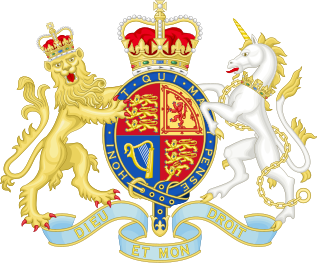 The National Government of 1937–1939 was formed by Neville Chamberlain on his appointment as Prime Minister of the United Kingdom by King George VI. He succeeded Stanley Baldwin, who announced his resignation following the coronation of the King and Queen in May 1937. 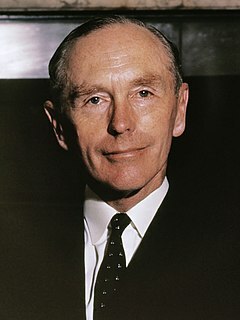 Sir Horace John Wilson, was a senior British government official who had a key role with government of Prime Minister Neville Chamberlain in the appeasement period just prior to the Second World War. Lieutenant General Sir Frank Noel Mason-MacFarlane was a senior British Army officer, administrator and politician who served as Governor of Gibraltar during the Second World War. Winston's War is a 2003 novel by Michael Dobbs that presents a fictional account of the struggle of Winston Churchill to combat the appeasement policies of Prime Minister Neville Chamberlain. The May 1940 War Cabinet Crisis was a confrontation between Winston Churchill, newly appointed as Prime Minister of the United Kingdom, and Edward Wood, the Viscount Halifax and Foreign Secretary, which took place between 25 and 28 May. Halifax believed that in view of the imminent Fall of France and the encirclement of British forces at Dunkirk, the UK should explore the possibility of a negotiated peace settlement with Adolf Hitler, with the still-neutral Italian leader Benito Mussolini brokering the agreement. After apparently considering the idea on 26 May, Churchill then outmaneuvered Halifax by calling a meeting of his 25-member Outer Cabinet two days later, where he urged the continuation of the war. 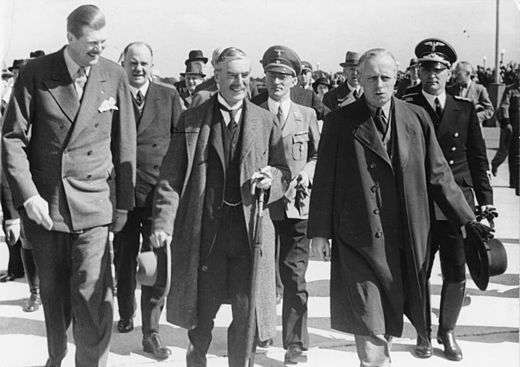 The European foreign policy of the Chamberlain ministry from 1937 to 1940 was based on Neville Chamberlain's commitment to "peace for our time", pursuing a policy of appeasement and containment towards Nazi Germany while increasing the strength of Britain's armed forces, until in September 1939 he delivered an ultimatum over the invasion of Poland followed by a declaration of war against Germany. 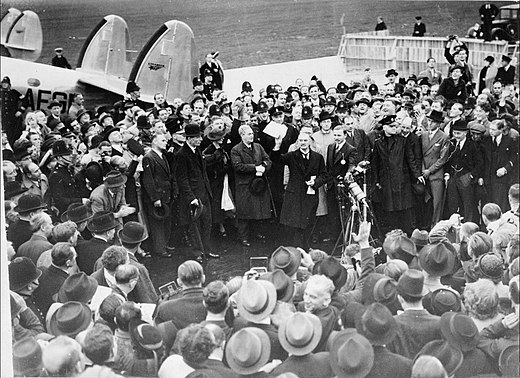 The early life, business career and political rise of Neville Chamberlain culminated on 28 May 1937, when he was summoned to Buckingham Palace to "kiss hands" and accept the office of Prime Minister of the United Kingdom. 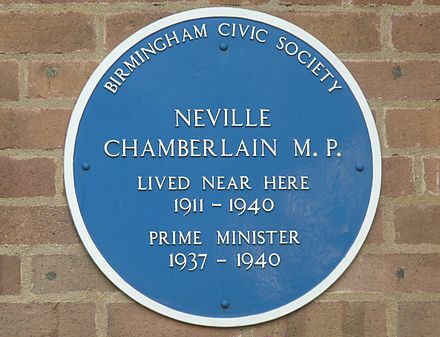 Chamberlain had long been regarded as Prime Minister Stanley Baldwin's political heir, and when Baldwin announced his retirement, Chamberlain was seen as the only possible successor. The Godesberg Memorandum is a document issued by Adolf Hitler in the early hours of 24 September 1938 concerning the Sudetenland and amounting to an ultimatum addressed to the government of Czechoslovakia. Richard Austen Butler, Baron Butler of Saffron Walden,, generally known as R. A. Butler and familiarly known from his initials as Rab, was a prominent British Conservative politician. Dawson, Sandra (2006). "Working-Class Consumers and the Campaign for Holidays with Pay (TCBH Postgraduate Essay Prize Winner for 2006)". Twentieth Century British History. Oxford University. 18 (3): 277–305. doi:10.1093/tcbh/hwm005 . Retrieved 12 September 2012. Hadley, W. W. (December 1941). 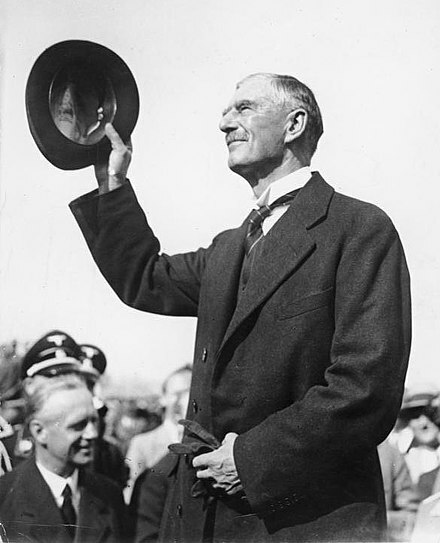 "Neville Chamberlain. 1869–1940". Obituary Notices of Fellows of the Royal Society . 3 (10): 731–34. doi:10.1098/rsbm.1941.0030. Aster, Sidney (1997). "Guilty Man: the Case of Neville Chamberlain". In Finney, Patrick. The Origins of the Second World War. Edward Arnold. pp. 62–77. ISBN 978-0-340-67640-0. Bond, Brian (1983). "The Continental Commitment in British Strategy in the 1930s". In Mommsen, Wolfgang; Kettenacker, Lothar. The Fascist Challenge and the Policy of Appeasement. 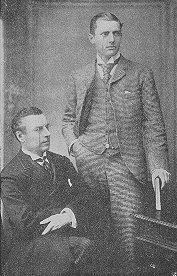 George Allen & Unwin. pp. 197–207. ISBN 978-0-04-940068-9. Goldstein, Erik (1999). 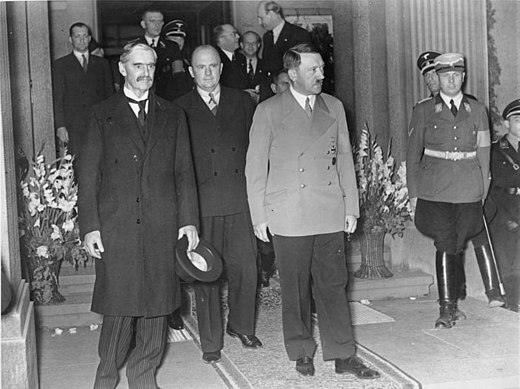 "Neville Chamberlain, The British Official Mind and the Munich Crisis". In Mommsen, Wolfgang; Kettenacker, Lothar. 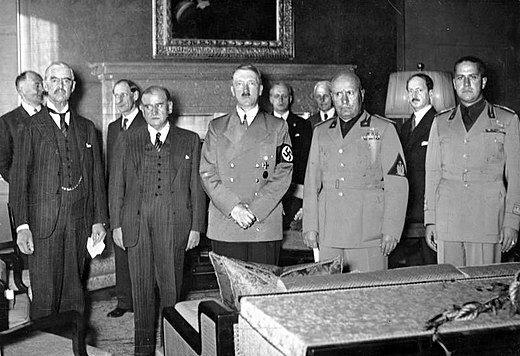 The Munich Crisis 1938: Prelude to World War II. Frank Cass. pp. 276–92. ISBN 978-0-7146-8056-9. Greenwood, Sean (1999). "The Phantom Crisis: Danzig, 1939". In Martel, Gordon. The Origins of the Second World War Reconsidered: A.J.P. Taylor and the Historians. Routledge. pp. 225–46. ISBN 978-0-415-16325-5. Kennedy, Paul; Imlay, Talbot (1999). "Appeasement". In Martel, Gordon. The Origins of the Second World War Reconsidered: A.J.P. Taylor and the Historians. Routledge. pp. 116–34. ISBN 978-0-415-16325-5.